There are many programs offered by the MFD Community Relations Department. The department is committed to community outreach and serving the citizens of the City of Milwaukee. If you would like to take advantage of one of the programs offered by the MFD Community Relations Department, please completely fill out and submit the online Program Request Form. Not all programs can be requested by the public. The program request form lists the programs that can be requested. Request forms will only be accepted for events that are more than 3 weeks away. Career Opportunities & Recruitment: Firefighters/EMTs or paramedics talk about their career and what it takes to become a Fire/EMS professional. Emphasis is placed on general fire service recruitment or specific recruitment and information can be provided on our Fire Cadet program. Preferably, this is offered to groups ages 15 and above. For younger ages please see “School Fire Prevention Program” below. Elder Safe Program: Older adults today are more active and living longer, with the Milwaukee Fire Department recognizing the value of better health which equals more independence. This program provides older residents information of the services offered by the Milwaukee Fire Department and additional resources provided by other agencies. The Elder Safe Program is designed for assisted and independent care facilities, religious groups, senior housing facilities and other organizations whose focus is on education and safety of older adults. Lasting from 30 to 60 minutes, the presentation covers seasonal safety concerns, safe cooking, safe heating and safe living. Additional emphasis is placed on injury prevention, handling medical emergencies and preventative health practices for the enhanced quality of independent living. Educators also distribute the "File of Life"; a recognized holder that contains a resident’s medical information that will be necessary should an emergency arise. EMS / Health and Wellness Program: The Milwaukee Fire Department takes the health and well-being of the community and its residents very seriously by having Firefighter/EMTs and Paramedics present information and answer questions about the City of Milwaukee EMS system. The MFD provides invaluable information focused on increasing the quality, availability and effectiveness of community-based wellness programs designed to prevent disease and injury, improve health, and enhance quality of life. The presentations can be tailored to a specific audience such as school-aged children, teenagers, or adults, and is given in schools, places of worship, senior groups and neighborhood organizations. Emergency Preparedness Plan Review: The Milwaukee Fire Department stresses, in this program, the importance of emergency planning and preparedness for your facility, organization and employees’ safety. Topics covered include preparing for and handling various emergency situations, identifying possible hazard practices and individuals at possible risk. The MFD Educators will review your current Emergency Action Plan with staff and provide resources for your organization on how to assess safety risks, set up procedures, and maintain a plan that fits the specific needs of the facility. Firefighters can attend a meeting or event to improve any emergency response by becoming familiar with the building, identifying possible hazards, and reviewing your plan to offer advice and answer pressing questions. Businesses large and small should have a plan in place for most disasters, big or small. Several Milwaukee businesses have found great value in the improved communication and insight provided by the Milwaukee Fire Department before an emergency occurs. Emergency Preparedness Plans should include identification of hazards, individuals at risk, location of exits, and exit routes as well as staff responsibilities for continued training. Follow this link more information on the City of Milwaukee Emergency Preparedness Code . *MFD Junior Fire Institute: Gives young people, ages 14-20, valuable insight into the firefighting profession. This allows the individual to decide whether to pursue a greater role in the fire service. By participating in the Junior Fire Institute, the individual will gain personal confidence, learn how to use various tools, develop mechanical skills, and gain greater awareness of personal and fire safety. Fire Apparatus Display: Front line Fire/EMS companies are available to give demonstrations of firefighting equipment and discuss fire prevention information to the residents in the areas they serve. MFD engines and trucks are available to make an appearance at local community functions, so your organization or neighborhood group can have the opportunity to interact with your local firefighters without the emergency prerequisite. Firefighters will give tours of the apparatus, put up the aerial ladder, distribute safety information, and answer questions of those in attendance, making your event an educational experience as well. Apparatus exhibitions can be canceled due to inclement weather; if there is a rain date for your event, please include this date in your request. Appearances may be shortened or canceled due to emergency service needs and the apparatus will remain in-service during your event and may need to leave during the event. Fire Education Table / Health and Wellness Fair: The Milwaukee Fire Department places a great emphasis on fire prevention education, along with improving the health and quality of life for the City’s residents. Fire education booths are a vital addition to any organization’s health fair or community event. Every year fire education specialists reach over 10,000 people with important messages on how to stay safe in the home, workplace, and at schools. Active Firefighter/EMTs or Paramedics staff public information booths and answer specific questions and pass out literature to attendees. When requesting this type of program, please be specific in describing the type of event, its purpose, the intended audience, and the primary language spoken by the attendees. *First Responder Install: Engine and Truck Companies in the city are provided with smoke alarms. This program allows fire companies an opportunity to install smoke alarms where needed after an initial call for service has been addressed. *F.O.C.U.S Community Fire Safety Campaign: FOCUS stands for Firefighters Out Creating Urban Safety. FOCUS is a door-to-door campaign intended to promote fire safety awareness and proper use of smoke alarms. Firefighters go into their neighborhoods and spread the fire safety message, as well as check and install smoke alarms when needed at no charge in all single- and two-family residences. Historical Museum: A facility located in an old firehouse at 1615 West Oklahoma Avenue. The museum is open the 1st Sunday of each month (excluding holidays) 1:00 PM – 4:00 PM or they give a tour by appointment. Attendees will learn about and see the history of the Milwaukee Fire Department. Fire Safety programs can also be tailored to audiences and can include general fire safety messages, the importance of smoke alarms, the need for 2 ways out, and having a specific meeting place outside. Hands-Only CPR: Working with the American Heart Association, the Milwaukee Fire Department will instruct attendees with the steps to take when someone has sudden cardiac failure and collapses. You will learn when to activate the 911 system, the steps to take to provide CPR to the patient until EMS can arrive, and the proper use of an AED (Automatic External Defibrillator). Youth Firesetter Intervention: A program aimed at counseling young people who have a history of misusing flammable materials. Firefighters/EMTs and paramedics help juveniles and their families understand the destructive nature of fire. Media Requests: All media requests including television, radio and print should be directed to Lieutenant Michael Ball, Community Relations Director for the Milwaukee Fire Department. Occupational and Residential Fire Safety Presentation: An Occupational and Residential Fire safety presentation is given to prepare for when disaster strikes. During these presentations an experienced firefighter will educate your group on what practical steps to take during an emergency. These can include prevention of fires and evacuation during a fire, recommended training, and how to prepare for tornados and other threats. This training is recommended for those in assisted living facilities or living in senior living communities; however, it is open to all age groups that may experience living situations that present specific hazards and unique options in the event of an emergency. Given to school teachers, businesses, etc. *Poster-to-Billboard Contest: Established in 1999, this contest is a great way to get the fire safety message out. City of Milwaukee Public and Private School students create posters on their interpretation of a given Fire Safety topic. The winning poster is made into a billboard to be displayed during the month of October. Winners are selected, then the winners and their class may receive tickets to sporting events in and/or other prizes. This contest starts in September and winners are selected by the first week of October (Fire Prevention Week). 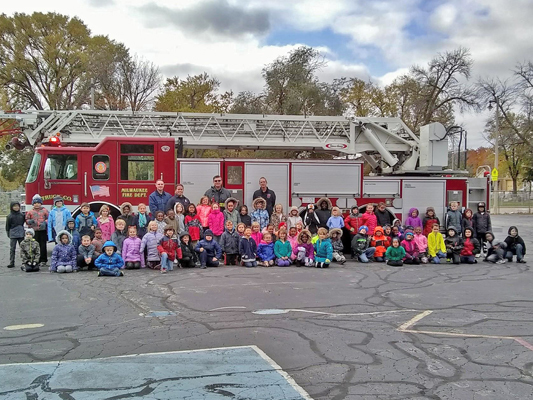 School-Aged Fire Prevention Program: This event is classroom based and will present children with basic information on what to do when encountering a fire. Topics can include; “Tools not Toys”, “Stop, Drop, Cover, and Roll”, “Stay Low and Go”. Discussions include dangers of playing with lighters and matches, having two ways out of your house, having a meeting place, and using 911. Programs are tailored in time and content to the age and needs of the class. Smoke Alarm Hotline: City of Milwaukee residents who live in single family or two-family homes and are in need of a smoke alarm because they do not have one can call the hotline to have fire department personnel come out and install one for them. The hotline number is: 414-286-8980. Landlords or residents in multi-family apartments with smoke alarm needs or requesting inspection information are encouraged to contact the appropriate department by following these Neighborhood Services links Quick Assistance Link (English) or Quick Assistance Link (Spanish). *Survive Alive House: The Survive Alive House is located at 2059 South 20th Street. Elementary school children are taught home fire safety and safe exit from a simulated burning building. Classes are scheduled subject to vacancies in the MPS programs. Survive Alive House, Mobile Units: Every year thousands of Milwaukee children get the opportunity to experience the Survive Alive House. For those we miss, we bring the experience to you. The Milwaukee Fire Department has two mobile Survive Alive Houses. One can be found on the Summerfest grounds during most of the summer festivals. The other can be brought to you. These mobile units give children the educational experience of escaping from a house fire. Children are given a brief instructional introduction and then are ushered into a bedroom. Cinematic smoke is pumped into the room and children are given an opportunity to demonstrate how they would get out. Staying low below smoke, feeling the door, and yelling for help are all reinforced during this unique learning experience. Private schools are encouraged to have their students participate in this unique learning opportunity. Community groups hosting large events may make a request for the mobile Survive Alive House. Reservations for the Mobile Survive House are only available May – September and are weather permitting. Other restrictions may apply. This is intended to be an educational experience for the children and their parents. Firehouse Tours, Milwaukee Fire Department: There are 30 firehouses in the City of Milwaukee. To find your local firehouse please click here. Each firehouse is strategically located so an MFD vehicle can reach your home in a very short amount of time. In the event of a non-emergency, you can reach your local engine house in less than 7 minutes if you drive. When visiting your local firehouse, remember that the firefighters are still "in-service" and may be required to leave quickly in the event of an emergency. The Milwaukee Fire Department is able to accommodate firehouse tours for those with physical disabilities at the following ADA compliant firehouses: 12, 22, 35, and 36. Please indicate and ADA need when completing the request form. *Indicates this program cannot be requested by the public. Hands-Only CPR is CPR without mouth-to-mouth breaths. It is recommended for use by people who see a teen or adult suddenly collapse in an "out-of-hospital" setting (such as at home, at work, or in a park). It consists of two easy steps: 1) Call 911 (or send someone to do that) and 2) Push hard and fast in the center of the chest. It can be difficult at times to know if you are having a real medical emergency. Many people are not aware of the symptoms that are indicative of a serious medical condition. Please use the following links to help you identify the symptoms that are associated with strokes and heart attacks to be sure you call for the help when needed. Learn about your responsibility to eliminate fire hazards.